An Egyptian man accused of hijacking a passenger jet and forcing it to land in Cyprus while strapped with fake bombs may be prosecuted in his own country. Egypt’s public prosecutor has asked Cypriot authorities to extradite Seif Eldin Mustafa, according to Egyptian state television reports. 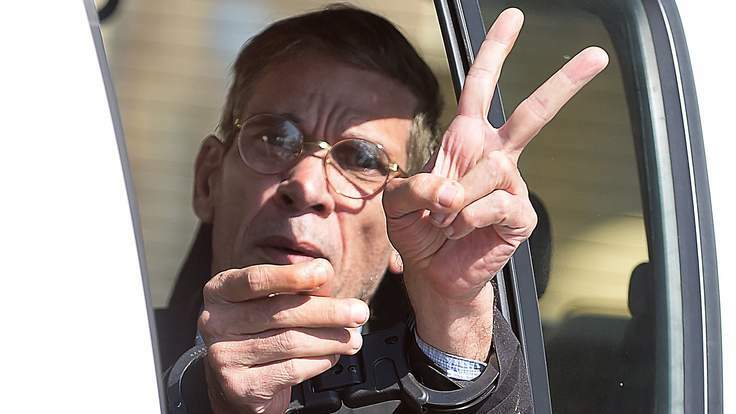 Mustafa, who has been described by officials as being “psychologically unstable”, was remanded in custody earlier for eight days on suspicion of hijacking an EgyptAir aircraft. No formal charges were put to the 59-year-old during Wednesday’s brief hearing at the District Court in Larnaca, Cyprus, but he could be charged with hijacking, illegal possession of explosives, kidnapping and threats to commit violence. He is accused of taking over the jet during an internal flight from Alexandria to Cairo. The Egyptian held four crew members and three passengers hostage during an eight-hour stand-off, claiming he was wearing a suicide belt. He later freed the group and handed himself in to police after making a series of “incoherent” demands. Although his motives remain unclear, Cyprus’ foreign minister Ioannis Kasoulides said it had not been a terrorist act, but was linked to a “family feud” involving Mustafa’s estranged wife with whom he has four children. It was later established the belt contained no explosives and was instead packed with mobile phone covers. Four Britons were among the 56 passengers on the aircraft when it was hijacked on Tuesday morning, with most of the passengers released after landing in Cyprus. Ben Innes, a British health and safety auditor from Leeds, was one of at least two Britons held for hours by Mustafa and took a photo with a huge grin on his face alongside his captor. Mr Innes told The Sun he “just threw caution to the wind while trying to stay cheerful in the face of adversity”. “I figured if his bomb was real I’d nothing lose anyway, so I took a chance to get a closer look at it,” he told the newspaper.